We’d love your help. Let us know what’s wrong with this preview of Gathering the Threads by Cindy Woodsmall. After three months ofdraus in da Welt, Ariana has returned to Summer Grove, the Old Order Amish community where she was raised for twenty years, and life with her Brenneman family. Skylar Nash, the Englisch-raised young woman is working in Ariana s cafe while getting to know her birth family and their Plain way of life. Skylar's time in Summer Grove has changed her outlook After three months ofdraus in da Welt, Ariana has returned to Summer Grove, the Old Order Amish community where she was raised for twenty years, and life with her Brenneman family. Skylar Nash, the Englisch-raised young woman is working in Ariana s cafe while getting to know her birth family and their Plain way of life. Skylar's time in Summer Grove has changed her outlook, just as Ariana has grown to see her personal faith in God in a different light than the manner she was taught while growing up. Both women will have to make decisions about their paths and Ariana must decide what role her childhood friend, ex-Amish Quill Schlabach, will play in her life. To ask other readers questions about Gathering the Threads, please sign up. GATHERING THE THREADS is the third and final book in The Amish of Summer Grove series. I really enjoyed the first two but this one, I loved. I couldn't ask for a better wrap up to a series than GATHERING THE THREADS and Cindy Woodsmall captivated me from the very beginning and never let my heart go until the very last page. I love the way Ms. Woodsmall combines the Amish world with the Englisch world and this beautiful and emotional story is exactly why. Ariana has returned to her Amish community after living with her Englisch dad for three months. There was a fire on the day she was born and she was switched with another baby who was raised Englisch but is really Amish. Skylar, the other baby, is twenty, just like Ariana, and she has been living with her Amish family while Ariana was with her Englisch family. Skylar isn't going to be joining the faith that her real family is living in, but she learns many many lessons from them and the way they live. GATHERING THE THREADS has Ariana questioning her faith and the way everyone just accepts whatever the bishop says even if they don't agree with him. While she was away, she learned a lot about social injustice and helping women and children who are in abusive situations. Ariana wants to teach the Amish women about this and feels it's time for a change in their faith. My emotions were all over the place while reading GATHERING THE THREADS and one minute I was happy and smiling and the next, my heart was breaking. I felt bad for Ariana and felt as if the whole community was ganging up on her at times. Will Skylar take the plunge and give up her worldly ways? Will Ariana give up her Amish faith and become an advocate for abused women and children? Will Rudy learn to love the changes in Ariana? Will Quill finally confess his true feelings for Ariana? So many questions and when you read GATHERING THE THREADS you will get all the answers! While you can read this heartbreaking story as a stand alone, I would suggest reading all three in order so you can get all the background on all of the characters. This conclusion to the Amish of Summer Grove series continues the story of Ariana and Skyler, two young women who were switched at birth. In Ties That Bind the mistake was uncovered, and in Fraying at the Edge the women traded places, with Ariana going out into the world to learn new things and Skyler experiencing the Amish way of life for the first time. Ariana managed to reach an agreement with her biological family to go back to the Brennemans before the end of their one-year deal, but now th This conclusion to the Amish of Summer Grove series continues the story of Ariana and Skyler, two young women who were switched at birth. In Ties That Bind the mistake was uncovered, and in Fraying at the Edge the women traded places, with Ariana going out into the world to learn new things and Skyler experiencing the Amish way of life for the first time. Ariana managed to reach an agreement with her biological family to go back to the Brennemans before the end of their one-year deal, but now that she is home she's met by a cacophony of inner voices telling her who she is and what she should believe. Has she lost herself in the midst of trying to navigate both Amish and English worlds? GATHERING THE THREADS is the third and final book in this series, and I highly recommend readers read the books in order, starting with Ties that Bind and Fraying at the Edge. Ariana is back with the Amish - in person - but the Englisch world has left some gulfs between her old world and her new one. Bridges need to be built but whether Ariana is truly accepted in her old home remains to be seen. The bishop, preacher, and deacon seem against her and preach about her sins -- as if it was her faul GATHERING THE THREADS is the third and final book in this series, and I highly recommend readers read the books in order, starting with Ties that Bind and Fraying at the Edge. Ariana is back with the Amish - in person - but the Englisch world has left some gulfs between her old world and her new one. Bridges need to be built but whether Ariana is truly accepted in her old home remains to be seen. The bishop, preacher, and deacon seem against her and preach about her sins -- as if it was her fault she was reunited with her biological parents. I absolutely LOVED Gabe. He is a total sweetheart, kind, considerate, and so calm. He loved his family with everything he had in him, but was called to sometimes do dangerous jobs. Ari broke my heart, struggling to fit into both worlds, and yet stay true to herself. But who is she? Will she ever find her place? I couldn't put this book down and read it in spurts across two days. I loved this entire series. Highly recommended. Don't miss GATHERING THE THREADS. Gathering the Threads concludes the Amish of Summer Grove series, and it’s really best to read the first two books before starting this one. That’s because the compelling story of two babies switched at birth – one raised Amish, the other raised Englisch – begins in Ties that Bind and continues in Fraying at the Edge. And then this book, where the threads of their story are finally gathered into a finished piece of warmth, faith, and family. Ariana is probably my favorite character, perhaps because of the way she finds her voice – and her faith – in Gathering the Threads. After sampling the world to which she ‘should’ have been born, she returns to her Amish family with fresh eyes newly keen to areas in which tradition has surpassed Scripture. The discussions that Ariana starts, as well as some long-held secrets coming to light within the community, bring about important topics for readers to debate as well. No matter what faith background we come from tradition works its way in so stealthily, doesn’t it? Not that tradition is bad… in fact, tradition is most often good and grounding. The problem occurs when we give those traditions the same level of power – or even more – that we give to God’s Word. This is not an Amish utopia. These are human characters, after all. And as such, they are flawed and sinful by nature. And anytime tradition becomes law, the danger of abuse and shame tends to rise. To that aspect, I love Quill’s character and the role he plays in helping those Amish who just can’t live in the legalistic (and possibly even harmful) environments anymore. Bottom Line: Gathering the Threads by Cindy Woodsmall is compelling and engaging, as is the entire Amish of Summer Grove series. Relatable characters just as flawed as the rest of us learn to adjust to life on the other side of the unthinkable and in so doing they teach us, the readers, about the true meaning of family and embracing a God who loves us no matter our circumstances. The concluding book of the Amish of Summer Grove series, Gathering the Threads, takes an already unusual story for "Amish fiction" and packs a powerful ending as the threads of this group of people thoroughly mended together by family, life, faith, and community are finally sewn together into one beautiful finality. This is not your typically sweet, quaint story of the people who are of Amish Christian beliefs and live in their strict community. It is one where the outside world has already broke The concluding book of the Amish of Summer Grove series, Gathering the Threads, takes an already unusual story for "Amish fiction" and packs a powerful ending as the threads of this group of people thoroughly mended together by family, life, faith, and community are finally sewn together into one beautiful finality. This is not your typically sweet, quaint story of the people who are of Amish Christian beliefs and live in their strict community. It is one where the outside world has already broken the barriers and now openings to customs, people, problems, thought processes, and solutions so very different from their own bring to the forefront issues long buried or tolerated. And yet into their own rigidly controlled faith community where the Bishop's rule overrides all thought and even Biblical injunctions, they find that they still have obligations to the laws that government people of all communities. Interestingly, Gathering the Threads is also a story about an awakening to social injustices and a move to secure the protection of those abused in their homes. There is a need for change and a need for forgiveness. And there is love or romance that is tenderly woven through and it is, of course, quite discrete and definitely a good, clean read. While Gathering the Threads, can surely be read as a stand-alone book, it will be more enjoyable to read books one and two in the series. I personally recommend you read the books in succession simply because they are all good reads and worth delving into. Gathering the Threads is a very heartwarming novel written by Cindy Woodsmall in her The Amish of Summer Grove series. This is the third and final book in this series which brings mixed emotions to me. There was a phrase in this book 'Love bears all things and keeps on thriving' and this phrase sums up alot of the plot of this book and series. I absolutely loved this storyline and it made it a wonderful series. When this third book opens the author offers a prolog that was a great help pulling th Gathering the Threads is a very heartwarming novel written by Cindy Woodsmall in her The Amish of Summer Grove series. This is the third and final book in this series which brings mixed emotions to me. There was a phrase in this book 'Love bears all things and keeps on thriving' and this phrase sums up alot of the plot of this book and series. I absolutely loved this storyline and it made it a wonderful series. When this third book opens the author offers a prolog that was a great help pulling things from my memory that occurred in the previous two books. The author reacquaints her readers with the amazing characters that are extremely likeable. My favorite character was Ariana and there were several times when I thought things were not fair to her. With Ariana being a strong independent Amish young lady she was held to standards that she found difficult to agree to. One thing that remained a constant in her life and that was her childhood love, Quill. Even though she knew a future with Quill was impossible she still found ways to nurture her relationship with him. There is also a slight mystery to this series that centers around Ariana's best friend Freida. Quill is involved with Freida and Ariana could not understand what was taking place and why. When this plot starts playing out you will be surprised at the outcome. This is where the story really gets to the point of being impossible to put the book down. When the story comes to the epilogue you may be surprised at what has taken place. This book brought out so many emotions from confusion, to sadness, to pure delight. All making for an excellent book that I highly recommend to all those who love the Amish genre along with romance. I have rated this book with five stars for meeting my expectations of a wonderful story. I was not given a complimentary copy of this book to read and review. I was not asked to post a favorable review. All opinions and statements expressed are strictly my own. 'Gathering the Threads' ends where 'Fraying at the Edge' left off as the third book in the Amish of Summer Grove series. If you have not yet read the first two books then I must insist that you do. The story builds on each beginning book. It might be doable as a standalone but I highly discourage it! Seriously, read the series! Ariana is back in Summer Grove where she always thought she wanted to be and Skylar, for now has decided to remain as well. But, it's not all sunshine and roses as Ariana 'Gathering the Threads' ends where 'Fraying at the Edge' left off as the third book in the Amish of Summer Grove series. If you have not yet read the first two books then I must insist that you do. The story builds on each beginning book. It might be doable as a standalone but I highly discourage it! Seriously, read the series! Ariana is back in Summer Grove where she always thought she wanted to be and Skylar, for now has decided to remain as well. But, it's not all sunshine and roses as Ariana tries to navigate the life she thought she always wanted with her newfound understanding of life from the outside world. I truly grew to love Skylar, until about page 226. She dog-eared a book. The love was over. I still liked her but who does that?!? I like that she knows herself enough to know that she doesn't know herself at all. I respect that she finally finds herself and knows that while she will never be Amish she also can never go back to who she was and then finds the perfect way to blend those together. The trips, as Skylar has come to refer to herself along with Ariana and Abram, have all grown through this experience. The entire family has grown and that spills over to their community. Abram found his voice, literally and figuratively. He's no longer the retiring shy young man he started as. He found his voice and he found his future. Honestly he is one of favorites and I'd love to see the rest of his life sometime. Ariana however, she tries my patience. At first I was clueless as to why she was so dang attached to that phone but I get it. It wasn't the phone but what it represented. She put herself, her family, her community and me through a lot of trouble for a stinkin' phone. Seriously, I'd decided she was Skylar in reverse and I really couldn't stand her. She was petulant and whiny and I was over it. Eventually it all made sense but geez she was still a bit over the top. This book, this entire journey, did not end how I anticipated and at first I wasn't certain I was OK with how it turned out. I had to sit and stew it for a bit. Eventually I came to terms with how it all turned out and actually respected and appreciated that sometimes hard choices aren't as hard as them seem, nor as easy as they appear. I came to be OK with the conclusion though obviously want no need more. I'd like to see the stories of the supporting characters to continue on another time in another book. Or even another series. I was provided a complimentary copy of this book by Cindy Woodsmall and WaterBrook & Multnomah Publishing. I was not compensated for this review and all thoughts and opinions expressed are my own. I was not required to write a positive review. The series begins with Ties that Bind followed by Fraying at the Edge before concluding with this book. I highly suggest reading the books in order as the story develops on many fronts with differing characters plus it is quite enthralling to read. I found myself caught up in the story of Arianna and Skylar’s predicament as well as how it was impacting the community and families. The author did a wonderful job by including a recap of the story from the first two books in the series to help remind readers what has occurred in the plot up to this point. I found including that very helpful, especially when time has elapsed between books for those who are voracious readers to be reminded of what happened as well as who the players are in the story. The author really kept me suspended as I kept reading to try and learn what the final decision for Ariana was going to be. I really found the story intriguing as the main two characters Ariana and Skylar throughout the series were on a journey of discovering who they were and what they wanted to do with their lives even in the midst of trying circumstances. Grab the books and then be prepared to sit and be engaged in the story from start to finish. Then, consider sharing the books or gifting copies of the books to other readers too! Gathering the Threads is a powerful story bringing a conclusion to The Amish of Summer Grove. Readers will want to read the series in order to appreciate the depth and awesomeness of this series. Arianna is back in her Amish community with being accepted back by some and others especially the bishop and ministers against her and the time she spent with her biological family. It wasn’t her fault she had been switched at birth only to discover the truth as a teenager. Skylar adapted to staying wit Gathering the Threads is a powerful story bringing a conclusion to The Amish of Summer Grove. Readers will want to read the series in order to appreciate the depth and awesomeness of this series. Arianna is back in her Amish community with being accepted back by some and others especially the bishop and ministers against her and the time she spent with her biological family. It wasn’t her fault she had been switched at birth only to discover the truth as a teenager. Skylar adapted to staying with her Amish family, the Brenneman’s, but there were some issues that didn’t set well with Arianna being back. Strong, faithful and dedicated Quill to his Amish widowed mother and those abused in the English world. With the turn of events that transpired which enlighten the Amish community why Quill had left initially, will the characters discover their true selves? Will those who were in authority coming down with harshness, self righteousness and controlling members be dealt with? Will the Brenneman’s family find renewed strength and a brighter future without struggling for their every day needs? Cindy Woodsmall dealt with some serious issues that can arise in an Amish community with a true portrayal of how they can play out when individuals in leadership with power bullies others for their own gain. One quote that she used that readers can apply to their own lives when in difficult situations is: “This above all—to thine own self be true, and it must follows, as the night the day, thou canst not then be false to any man.” William Shakespeare. I received a copy of this book from a friend after she knew I had read the first two. I was not required to write a review but have shared my honest thoughts. This is book three of three in the series, Summer Grove. The first two books were TIES THAT BIND and FRAYING AT THE EDGE. I always can tell if a book has meant something to me when I finish and I want more. This has been the way with this series. I'm an Amish genre lover but this series has been one of a kind. This third book is a continuation of Araina's story. I would definitely suggest reading the three books in order so you get the background on the characters and what's been going on.After Ariana has returned to her Old Order home from being in the Englisch world, she has many different feelings. At times she forgets about the Amish ways. You don't question your daed and when Araina does, her daed doesn't understand why his sweet daughter is questioning his authority. She's been in the Englisch world where asking questions and rebelling is part of life, but in the Amish world, questions are not asked by a daughter to her daed. She is now back in The Old Order Amish community and she must go by the rules. She is seen as rebelling and that is unacceptable. Will her Englisch ways spread to others in the Old World Community? Especially the young ones who are at that point of questioning where they belong, plain or Englisch. She is trying to put sense to what she's learned from her natural parents and the rules of her plain world. There are also secrets of sorts. Skylar has finally found sobriety and feels at peace in the household of the Brenneman's. What will Araina's coming back to the household do to her? She feels her sobriety is threatened. Skylar finally has become herself, she has found her true self and she has tried hard to put the past in the past. But with Araina's coming home, will that past stay in the past? Two people, Araina and Skylar must find what connects them and hold their faith and God close to their hearts to keep that past in the past. They can't let go of their faith. As always, Ms. Woodsmall has given us another wonderful, heart warming story about the Amish world. She has combined the plain world with the Englisch world. We are given two young women who are finding themselves, grasping their faith, and learning new things. The characters and the scenes are well described and lighten the heart. I always find that reading an Amish book rests my soul a bit. It brings a peacefulness after a long, stressful day. It also reminds the reader of their faith, regardless of what that may be. You don't have to be religious to enjoy this book or any Amish book. They are just good clean reads about another way of life and there are lessons to be learned while enjoying a good book, good characters and lovely communities. Gathering Threads is the dynamic conclusion to The Amish of Summer Grove series, and what a read and journey you are about to embark on as you turn that first page. Now this book can be read by itself, there is so much information provided to bring you up to date, but don’t deprive yourself, the first two books are tremendous and you don’t want to pass them up, and yes I have read them. Ariana, Abram, and Skylar, the Trips, or triplets, or torn apart twins because of circumstances way beyond their Gathering Threads is the dynamic conclusion to The Amish of Summer Grove series, and what a read and journey you are about to embark on as you turn that first page. Ariana, Abram, and Skylar, the Trips, or triplets, or torn apart twins because of circumstances way beyond their control. With this book both Ariana and Skylar are living with Brenneman’s, of course with their twin Abram, and find sibling rivalry at its best. This book is about closure, and forgiveness, and putting your feet on the right path, and yes the author has given us all of this. There is heartbreak, and then there is love and compassion, above all the Love of God. Ariana never wanted to go into the English world, but she did and has now returned to her roots, but you can see Gods plan written here, especially in the form of her atheist father Daniel. Then we see broken Skylar, and she is now drug free, but trying to find her place in her Amish family, and Abram, the kind, sweet, young man, who finds himself in love, but of course there are problems to overcome. We are also reunited with Berta and feel her pain and anguish, trying to live faith, but yearning for her family. There is so much injustice in this small community, and your heart will break for this strong woman, and you will love her son Quill, whose reputation in this area of Amish is not good, and yet he has a heart of gold and is there for his fellow men. There is a wonderful Epilogue at the end of this book, and I would love to continue here and receive more updates, but it is time to say goodbye, and you will be missed! Ariana dreamed and longed to return home to the life and family she had always known. A life that was taken away from her by the parents she didn't know. But her time away has changed her - opening her eyes see her once beloved life differently. And even more unsettling Skylar the young woman with whom she was mixed-up is still living with the Brenneman family. Skylar isn't ready to leave the Brennemans and return to her old life. She hasn't embraced the Amish lifestyle yet some aspects have helped her as she fought her addictions. But Ariana's return threatens the peace that Skylar is discovering. As Ariana struggles to once again find her place she has to deal with the suspicions of others within her community. Her ties with her Englisch family are cause for concern as is her re-established friendship with Quill Schlabach. Can Ariana be true to who she really is and the truths that she discovered about God? Or will she allow the pressures of her old life to suppress and constrict her new thoughts? Gathering the Threads is the concluding book in the Amish of Summer Grove trilogy. This book continues the look at family and what is more important in making a family - blood or love. It is also a study in how belief determines how we react to others and their beliefs. I find it interesting how Ariana's siblings treat her upon her return as compared to her parents, especially her Daed. I think one could most definitely describe this as an emotional book - not that it causes the reader to go through a range of emotions or even to get emotional. Rather this book expresses a range of emotions as the various characters work through their hopes and their fears. If you haven't read the first two books in the series you can get a quick synopsis at the beginning of the book and enjoy the story that is found within these covers. However, if you read the first two books you'll more fully appreciate what Skylar and Ariana are confronting when there are each presented with their new biological identities. I mean, who wouldn't have an issue or two to learn that you aren't quite whom you always thought yourself as being. The book and series conclude in a satisfying manner though I wouldn't have minded another book in the series (or another 100 pages or so in this book). If you're looking for a vacation read give this one a try. This book (and series) would be an excellent choice for a book club selection. It can be difficult to see a series come to an end, but what a way to end it! This was such an unusual Amish tale really, and lately that is the kind of Amish books I have been looking for. I will say this - if you haven't read the first two installments, you may be a little confused. The author did a great job in summarizing them in the beginning of this book, but let's face it - you'll want the whole story to connect with the characters. We all have things we have to face when growing up. We ma It can be difficult to see a series come to an end, but what a way to end it! This was such an unusual Amish tale really, and lately that is the kind of Amish books I have been looking for. I will say this - if you haven't read the first two installments, you may be a little confused. The author did a great job in summarizing them in the beginning of this book, but let's face it - you'll want the whole story to connect with the characters. We all have things we have to face when growing up. We make decisions that will have lasting effects on our lives. Ariana and Skyler had huge decisions to make here. Would they stay with what they knew, or go to the world they thought they needed to be in. Such an emotional rollercoaster, and really not just for the main characters. This decision affects to many people in their lives! Ms. Woodsmall has beautifully woven a story of friendship, following God, and how sometimes making the right decision can be extremely difficult. In the conclusion to the Amish of Summer Grove series, Ariana returns to her Amish home and family. If you have read the first two books, Ties that Bind and Fraying at the Edge, you’re aware that she was not born into an Amish family. Although this can be read as a stand alone, I encourage everyone to read the series in order to fully appreciate the story. It was difficult for Ariana to return after she has experienced living in the Englisch world, where she had the freedom to question thi In the conclusion to the Amish of Summer Grove series, Ariana returns to her Amish home and family. If you have read the first two books, Ties that Bind and Fraying at the Edge, you’re aware that she was not born into an Amish family. Although this can be read as a stand alone, I encourage everyone to read the series in order to fully appreciate the story. It was difficult for Ariana to return after she has experienced living in the Englisch world, where she had the freedom to question things and learning is encouraged. Things are definitely different in her Amish home and community, where women are more submissive. Skylar, having been raised by an Englisch family has been fighting her own personal battles and has hated being forced to live with her Amish family. I haven’t always liked her, but as she matured, I actually became fond of her. It was unimaginable to me to have your world turned upside down like theirs was. I wondered throughout the series if relationships would survive, if there would be forgiveness and if there would be genuine healing for everyone that went through such anquish. There are so many life changing decisions that the characters had to make all because of a mistake made twenty years ago that effected so many people. The author has penned another amazing series with amazing characters. She is one of my must read authors and one I highly recommend. I received a copy of this book from the publisher and have given my honest opinion. Cindy Woodsmalls Gathering the Threads is the sequel to Fraying at the Edge. It focuses on the two women who were switched at birth (Ariana and Skylar) and at the age of twenty sent home to their birth families. Ariana was raised in an Amish family and was forced to live with her mother and stepfather and also spend time with her atheistic father. Having been allowed to go home after three months, Ariana finds herself at odds with her Amish family while Skylar who kicked drugs and felt a part of Cindy Woodsmalls Gathering the Threads is the sequel to Fraying at the Edge. It focuses on the two women who were switched at birth (Ariana and Skylar) and at the age of twenty sent home to their birth families. This is the final book in the Amish of Summer Grove series. This book continues the story of Ariana and Skyler, two young women who were switched at birth. I have been a fan of Ms. Woodsmall for a long time and I love reading anything that she puts out. She always puts a different perspective of Amish Fiction with her careful crafting. Her characters are tangible. This is not your typical sweet Amish book - it collides with the English world, and the different areas that Amish are not accustomed This is the final book in the Amish of Summer Grove series. This book continues the story of Ariana and Skyler, two young women who were switched at birth. I have been a fan of Ms. Woodsmall for a long time and I love reading anything that she puts out. She always puts a different perspective of Amish Fiction with her careful crafting. Her characters are tangible. This is not your typical sweet Amish book - it collides with the English world, and the different areas that Amish are not accustomed to dealing with. This book is a great read and easy to follow. I love this set of books. They are uplifting, motivating, spiritual, hopeful and real. I'm glad it ended the way it did. I was worried for a while about who would end up with whom. I'll look for other books by Woodsmall. Gathering the Threads the 3rd book in the series Amish of Summer Grove by Cindy Woodsmall. After her time in the Enghish world Ariana is coming back to her Amish roots but can she Gathering the Threads the 3rd book in the series Amish of Summer Grove by Cindy Woodsmall. After her time in the Enghish world Ariana is coming back to her Amish roots but can she really go back? Has she seen and learned to much with the help of her English dad Nicholas. She never realized that the man she looked up to the most the bishop and his preaching qualified as bullying but was it? Still she longs to be back amoung her community and family. But can or will it work out the way she wants it too. Skyler has settled into her Amish life and now Ariana is coming back what does that mean for her? Will her Dad and mom Her Amish Parents not want her now? Now that she has been drug free will this cause her to want that fix again? I usually like reading Amish fiction, often I feel it's just kind of "fluff" but oh my, this series of three Amish fiction books in the series "The Amish of Summer Grove" by Cindy Woodsmall are not really fluff, though they are easily readable and VERY interesting! This book, Gathering the Threads, is (as it sounds) a culminating book in a series. I would REALLY suggest that you read the first two books in the series, as they are wonderful reads as well (but if you don't have the opportunity, th I usually like reading Amish fiction, often I feel it's just kind of "fluff" but oh my, this series of three Amish fiction books in the series "The Amish of Summer Grove" by Cindy Woodsmall are not really fluff, though they are easily readable and VERY interesting! Ariana is a young woman (early 20's) who was brought up in an Amish family with younger and older siblings, and even a twin. She is dedicated to her Old Order Amish lifestyle and attempts to talk her sibling out of leaving the group. Her world is completely shaken when she (and her parents) find out that she was mistakenly swapped at birth with another baby girl and she is actually not their biological child. Ariana's parents find their biological daughter and her parents and, at the threat of a lawsuit by the English father, the girls go for a trial period with their biological families. The biological child of the Amish family is Skylar, who is addicted to drugs and a very worldly lifestyle. Her parents are not married to each other, and they are anxious to find a "fix" for Skylar's destructive lifestyle. As Skylar enters an Amish family, she has struggles to find her place as well as coming to grips with her heritage. Ariana, thrust into an English lifestyle, has a very hard time, and her bio father has many demands on her as he tries to broaden her horizons. Through this all, a childhood friend of Ariana's (Quill) who has left the Old Order Amish life helps her out immensely. This third book, Gathering the Threads, is Ariana's re-entry into Amish life. Three months away have changed her in many ways. She has longed to return to her Amish family and fiancee and now that she's there, she is confused. She has learned that God's Word, the Bible, is what is important to follow, and is unsure about how the Amish bishops' rulings fit in with this. She earnestly wants to do what is right and unfortunately the church leaders give her an amazing amount of trouble. Her family is confused as well, and her Amish father exercises his strictness. So -- yes, yes, yes--read it! Enjoy it! Struggle a little bit along with Ariana to figure out Who is really in charge. "Just because people think they’re right doesn’t actually make them right…"
Returning to her Amish home, was a joyful event for Ariana Brenneman. And then, sitting at the family table, listening to her father dictate what w "Just because people think they’re right doesn’t actually make them right…"
Returning to her Amish home, was a joyful event for Ariana Brenneman. And then, sitting at the family table, listening to her father dictate what was to be done, triggered an unease in the young woman. Forced to live in the ‘Englisch’ world, when it was discovered, she was unintentionally swapped, at her birth, along with Skylar Nash, was an eye-opening situation. Relying on Quill Schlabach wasn’t an ideal, but he was her friend, despite the strained relationship, and he helped her out when she needed it. Isaac, Ariana’s Amish father, is in disbelief that his daughter, would defy him, his authority. At least her relationship with Rudy (the man she plans to marry) is still going strong. His wife, Lovina, is worried that the two won’t see eye-to-eye. After all, Ariana now knows what it is to live in the Englisch world. Can they truly expect her to be the same? Now that Ariana is back in the Amish world, will the fact that she wishes to keep the phone and occasionally contact Quill be condoned by the Bishop? And, how much more understanding will Rudy be about that aspect of her life? Finding her feet, and her place, in the Brenneman family, as well as the Amish community, Skylar is on the road to recovery from drug addiction. Just as she feels that she has control back in her life, in walks Ariana. What happened to spending a whole year outside of this community? And how come her Englisch father, Nicholas, seems so much more understanding of Ariana’s woes than he ever was of hers? Will the two ‘sisters’ find common ground? To be able to grow together in the Amish way? Whilst Ariana questions her belief in an (almost) oligarchical system, she knows her faith in God is unwavering. How can she be a part of two different worlds, when neither seem to want to understand the other? In the last part of the Summer Grove series, the story is focused more on Ariana, rather than Skylar, but doesn’t fail to impress. Whilst it would be easy to tie up loose ends, Woodsmall, spins a thoughtful, absorbing story, that is far from predictable. I really enjoyed how she pushed Ariana's thinking, yet being respectful of the Amish culture. There were so many emotions for the characters in this final installment - frustration, anger, disbelief, love, hope, happiness - that, as a reader, I was experiencing them along the way. As always, Woodsmall's characters have depth, personality and traits, that make them all endearing. This conclusion to the Amish of Summer Grove series continues the story of Ariana and Skyler, two young women who were switched at birth. In Ties That Bind the mistake was uncovered, and in Fraying at the Edge the women traded places, with Ariana going out into the world to learn new things and Skyler experiencing the Amish way of life for the first time. Ariana managed to reach an agreement with her biological family to go back to the Brennemans before the end of their one-year deal, but now that she is home she's met by a cacophony of inner voices telling her who she is and what she should believe. Has she lost herself in the midst of trying to navigate both Amish and English worlds? I've just finished reading Gathering the Threads. I am blown away. I’m astounded at how the story and message of this novel are relevant to everyone. If you didn’t read books one and two have no fear about jumping into the third and final installment of The Amish of Summer Grove series. The author begins this book by quickly catching readers up to speed in the first few pages. Ariana and Skylar were switched at birth. Ariana was raised in an Amish family and Skylar outside. The girls discover th I've just finished reading Gathering the Threads. I am blown away. I’m astounded at how the story and message of this novel are relevant to everyone. If you didn’t read books one and two have no fear about jumping into the third and final installment of The Amish of Summer Grove series. The author begins this book by quickly catching readers up to speed in the first few pages. Ariana and Skylar were switched at birth. Ariana was raised in an Amish family and Skylar outside. The girls discover this near their 20th birthday. Each family wants a chance to get to know their biological offspring. Thence the girls' year-long journey of living in strange new worlds. When this novel opens the girls have lived with their biological families for three months. Arianna was grateful to return to a place she called home. The reunion with family wasn’t as joyful as anticipated. Ariana’s eyes have been opened and the house and family didn’t feel like home anymore. She’s learned many things living in the world with all its newfangled technology but one of the main things she took away from being there was the fact that she can read the Bible and apply what she’s read to her life without Old-Order leadership dictating her every thought and move. This is a powerful story that deeply touched my heart as I saw these characters earnestly try to grasp and practice concepts from the Bible into their lives; even if it dispelled what they originally thought was true. I was delighted when it was revealed to their hearts that the “truth” would set them free in so many ways when they identified the lies they'd believed and had the courage to walk in the truth about God, themselves and others. I’m thankful for the way this author ended the series. I’m so glad this author had the courage to walk the path God had for her and write what she’s felt called to write. This author is a Blessing. Her work is phenomenal. This is a masterfully written must-read novel. It's one I won't soon forget. Wonderful audio book and a perfect ending to the trilogy. Arianna returns to her Amish parents a changed woman and fights for women not to be bullied. She has changed too much for Rudy. Skylar has gotten her life together and is accepted by both sets of parents. The series begins with Ties that Bind followed by Fraying at the Edge before concluding with this book. I have already read quite a few of Cindy Woodsmall's series and each time I have believed that that one was the best one I have read, that is, until I would read the next series. This time I jumped in on the last book first. I don't recommend doing that with this author, because when she writes a series, they are usually books that are closely linked to each other. Fortunately, before the The series begins with Ties that Bind followed by Fraying at the Edge before concluding with this book. I have already read quite a few of Cindy Woodsmall's series and each time I have believed that that one was the best one I have read, that is, until I would read the next series. This time I jumped in on the last book first. I don't recommend doing that with this author, because when she writes a series, they are usually books that are closely linked to each other. Fortunately, before the first chapter, this book had a running summary of the previous two books that I haven't read. It was so well summarized that I had no trouble reading this book by itself. But again, I really don't recommended that. Cindy Woodsmall's outstanding talent is to connect us deeply with her characters so that the reader forms an emotional bond and experiences the turmoil written about with the character. This is such a rare gift for a writer, so that when I find one I like to search for all their books and read them through. That's how I feel about this series. When I read the summary, I had to chuckle. It read like a soap opera. I say that in the kindest manner possible. This series is intense, if all the books are like this one. There are several well-planned out plots, complex characters, schemes, turmoil, twists and turns, and just plain anguish laid out in the first two books that continue in this one. It was quite an amazing task to see how it all resolved. But it was definitely and happily resolved, in a way only this author can accomplish. There are so many characters that are important to the series. Ariana is the one that stands out the most. Skylar is also another but not as much the focus as Ariana. Book three resolves a long standing issue between Ariana and Quill, a neighbor she had known since her childhood who had left the Amish years ago for reasons no one in the small community of Summer Grove really knew about and thus was a forbidden friend. Nevertheless, he plays a prominent role all throughout the series. Among the complexity of details there arises a theme that may surprise the reader as it becomes clear. Ariana learned about bullying while she was "out in the world" with her birth father. Interestingly, bullying takes on a whole different shape and color when she encounters it in the Amish community after she returns. Had it always been there and she had never noticed before? The running questions then became how would she deal with it living at home with her parents while preparing for her upcoming marriage? This was not a cut at the Amish community by the author, but rather a commentary of society, that it can happen anywhere, even in places we don't expect to find it. Finally, just like other books by this author, the spiritual elements of the story are authentic, realistic, respectful while helping us to gain some fresh perspectives on the character of human nature in general. Cindy Woodsmall's series are some of the best faith-based books I have ever read. They are not filled with platitudes or pat answers. Real issues are realistically dealt with that touched my heart deeply. Even though I haven't read the first two books, I know I will soon. So I can heartily recommend this series for you. If you like intense, complex characters who are not stereotypical Amish or non-Amish or former Amish, you'll love this series. "His Mamm called her the Thread Gatherer. Mann believed life was like an heirloom quilt that life ripped at the seams, and gatherers were rare. But Ariana took the frayed pieces and worked with them until the quilt could fulfill its purpose once again. Quill had seen her do it. At least once she had done it for him, when he was eighteen and his Daed died of a heart attack." 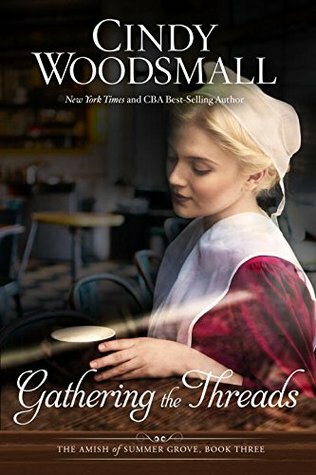 Gathering the Threads by Cindy Woodsmall is the third book in the Amish of Summer Grove series, and for this reader, I hope "His Mamm called her the Thread Gatherer. Mann believed life was like an heirloom quilt that life ripped at the seams, and gatherers were rare. But Ariana took the frayed pieces and worked with them until the quilt could fulfill its purpose once again. Quill had seen her do it. At least once she had done it for him, when he was eighteen and his Daed died of a heart attack." 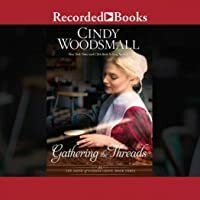 Gathering the Threads by Cindy Woodsmall is the third book in the Amish of Summer Grove series, and for this reader, I hope there is more. The best part of this novel that I really had to share is that at the beginning the author took the time to walk the reader through the previous novels to get them caught up to where this one begins. It is a rare jewel to find this in a series novel, but one I hope more authors will follow suit with.Ties That Bind and Fraying at the Edge are the first two in this series and should be read before picking this one up as it conveys so much more than a simple summary of the first two novels. Ariana Brenneman is far from the Amish girl that her community remembers anymore, especially her boyfriend Rudy. Even her parents are struggling to figure out just how to get back the Amish girl they have raised, but not the daughter by birth. It was through an accident at birth that Ariana and Skylar Nash were switched and both grew up being raised by parents that were not theirs until they recently discovered the grave error. Since spending months with her English family, Ariana has been exposed to things she never knew before living among the Amish and never once questioning the ways they lived and believed, until now. Being forced by the ministers, her parents and boyfriend, they believe such correction is necessary to help Ariana return to her former life. She can't. The only people that seem to understand her confusion is her best friend Quill Schlabach, also a former Amish man, Skylar, and her brother by being raised Amish Abram. They understand her confusion about trying to fit back into a society just because that is how you were raised but now are longer the same being exposed to reading the Bible for herself and understanding how the ministers in her community were manipulating things to work for themselves and not the community. It draws a line in the sand between the Amish upbringing she loved, and the new knowledge of what God has provided. Her parents are now faced with the prospect of being shunned if they can't control her defiant daughter, and her boyfriend Rudy isn't so sure he can wait for a girl that may no longer be who she was. This will be a true test of loyalty, love and faith for everyone if they hope to find a lasting peace among them all. This was the ending to a good story (This is the 3rd in the Amish of Summer Grove series - they must be read in the correct order to make sense). Gathering the Threads is a good title, because this book attempts to tie up all the loose ends of the trilogy. I think I got a little impatient at the end because it's pretty obvious what ending the author is moving toward, and it just drags on with little things always in the way. So many Amish/Englisch conflicts! Ariana's time in the world has opened This was the ending to a good story (This is the 3rd in the Amish of Summer Grove series - they must be read in the correct order to make sense). Gathering the Threads is a good title, because this book attempts to tie up all the loose ends of the trilogy. I think I got a little impatient at the end because it's pretty obvious what ending the author is moving toward, and it just drags on with little things always in the way. So many Amish/Englisch conflicts! Ariana's time in the world has opened her eyes to many of the shortcomings of the Amish Ordnung, but since she grew up Amish, the conflicts are nearly unbearable to her and sorting them out is very difficult. Always, the pull is toward the familiar ways, the loving embrace of her Amish family - until her newly acquired attitudes and understandings drive a wedge between them. Her switched-at-birth Englisch contemporary, Skyler, fares somewhat better - having conquered her drug habit and learned the value of work, Skyler is finding her niche in the Amish world. Since she grew up Englisch, she is not required to follow the Amish ways, and she chooses a different path - working at the cafe, going back to school, engaging in volunteer work that challenges and satisfies her, and beginning a tentative relationship with Jax, a young friend of the family. Quill remains the one constant in Ariana's world, helping her navigate the differences between Amish and Englisch; he is there to pick up the pieces that threaten to destroy her happiness. I think this book opened my eyes to at least one thing: a lot of people think the Amish ways are wrong, both culturally and spiritually. I've always been "live and let live" about the Amish - they are entitled to live the way they choose. But this author brings out that Amish women, especially, have little choice - they are taught obedience and submission from their earliest days. They are to submit to fathers, husbands, church leaders, and God. They have few choices, especially if they have joined the church. Even in matters such as health and crime, women are to follow the advice and direction of the men in their lives, whether or not they agree or feel comfortable. One wonders how often women and children are abused, even sexually, within a situation such as this. There is no way of knowing unless the abused is able to get away from the Amish, or someone outside the Amish knows about and reports the situation. That said, the Amish women I've been in contact with (there is a large community of them where I live, and several hundred of them are patients at our office) seem happy and content, if often tired and overworked. Their joy is in being good Amish wives and mothers. The unhappy ones are the ones who are barren - just as in old Israel, barrenness is considered a curse. I did witness one Englisch woman who tried to join the faith, but just couldn't hack the hardships of Amish life and left pretty quickly. Cindy Woodsmall might be considered somewhat of an authority on Amish life as she has lived near them most of her life, and had deep friendships with her Amish neighbors. I think that she uses this series to explore some of her questions and concerns about Amish life and culture and the things she would like to see change to open this cult-like spiritual group to a life with more knowledge and choices. Cindy Woodsmall is a New York Times and CBA best-selling author who has written nineteen (and counting!) works of fiction and one of nonfiction. She and her dearest Old Order Amish friend, Miriam Flaud, coauthored the nonfiction, Plain Wisdom: An Invitation into an Amish Home and the Hearts of Two Women. Cindy's been featured on ABC Nightline and the front page of the Wall Street Journal, and has Cindy Woodsmall is a New York Times and CBA best-selling author who has written nineteen (and counting!) works of fiction and one of nonfiction. She and her dearest Old Order Amish friend, Miriam Flaud, coauthored the nonfiction, Plain Wisdom: An Invitation into an Amish Home and the Hearts of Two Women. Cindy's been featured on ABC Nightline and the front page of the Wall Street Journal, and has worked with National Geographic on a documentary concerning Amish life. In June of 2013, the Wall Street Journal listed Cindy as one of the top three Amish fiction writers.